The recently launched Indices of Social Development provide measures of social institutions along five dimensions. The ISD data set covers five anchor years from 1990-2010 for some 200 countries. This paper seeks to examine the links between social institutions and common measures of society’s macroeconomic performance, well-being and inequality. The paper begins with a diagnostic inspection of the ISDs and raises issues in index construction and challenges in measurement. Descriptive statistics and visual presentations show the long-term trends of the indicated social institutions. With five data points for each Index, it is not possible to use parametric estimation techniques common in time-series studies. Taking a critical realist epistemological stance where empirical data are seen as emergent from underlying structures, the paper argues that certain quantitative analysis can nevertheless be fruitfully employed. 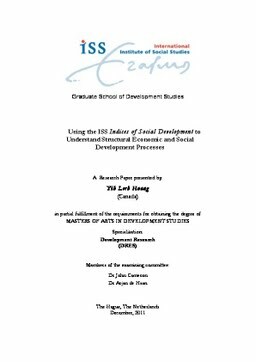 Using a logic first proposed by Granger (1969), followed by a second round of statistical analyses, the paper tentatively posits the inter-relations amongst social institutions and links these with GDP Per Capita, HDI and Gini. A case study in the Inter-group Cohesion Index demonstrates how changes in social institutions could be understood in the context of global events. The paper provides new insights in the understanding of structural elements in development.